Most of the Credit CARD Act of 2009, that well crafted and thoroughly thought through law that will fix all that is wrong about credit cards and allow us to carry guns in National Parks, comes into effect on February 22nd. So it’s time for bloggers like me to revisit the act, particularly some of the less widely discussed provisions, and tell our readers all about the big changes on the way. Wallet Pop beat me to it last week with a post Lenders plan to guess your income from credit report. 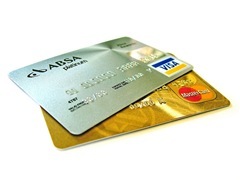 It was about how the CARD Act "requires lenders to consider your ability to pay any new or additional debt before approving a credit card application." Apparently, that means verifying income, which puts a damper on those really annoying pitches you get to open a store-branded card whenever you try to buy something. "Retail stores are quite upset about this change in the instant approval of their cards," Bill Hardekopf, CEO of LowCards.com, wrote to WalletPop by e-mail. "Consumers now need to show proof of income when they apply for a card, and not many of us carry this around when we are shopping in the mall." This made me, briefly, optimistic that the CARD Act would improve my life after all. I hate it when the salesgirl extends the time it takes to check out by asking me if I’d like to save 10% and open a new account. That’s three seconds of my life I can never get back. The only thing worse is when she asks the guy in front of me on line and he says yes. Alas, I’ve now looked into it and I think it is pretty clear that I will continue to suffer this particular indignity. I read the CARD Act itself (it’s a surprisingly brief 33 pages with giant margins) and found that it says only that a new account may not be opened "unless the card issuer considers the ability of the consumer to make the required payments." Italics mine. On one hand, this is a delightful dig at card companies, implying that until now they were issuing cards without so much as considering the ability of the borrower to repay the loan. On the other, mandating merely that they consider this factor is bizarrely minimal. It would be like announcing that, henceforth, drivers will be required to attempt to avoid head-on collisions with oncoming traffic. Of course, I know how the world of government works. Congress writes a one sentence provision and the bureaucrats turn it into a novel-length web of regulations. And sure enough, the Fed has issued an 1155 page amendment to its Truth in Lending (Reg. Z) rules to implement the CARD Act. I did not read the entire thing. But PDFs are searchable, and I found nothing to rekindle hope that salesgirls will soon limit conversation to a perfunctory "How are you today?" information in a consumer’s credit report." In other words, to satisfy the implied requirement to have enough information to consider ability to repay, a card issuer need only a) ask the consumer if he has income over a certain level or b) infer that fact from his credit report. In fact, based on my skimming of the regulations, it is not clear to me that a lender could not just put a tick box at the bottom of every application reading "Check here if you believe you can repay this loan." Or, if the lender worries that asking consumers to tick a box would slow things down too much, an automated analysis of credit history will do. The Fed explicitly allows lenders "to make a reasonable estimate of the consumer’s income or assets based on empirically derived, demonstrably and statistically sound models." That sounds a lot like a modified credit score, which leaves me wondering in what way, exactly, this is a change from current practice. And just in case you clung to the hope that this provision would have any practical effect whatsoever, the Fed makes clear that by "required payments" it is meant only the minimum payments on the card. So lenders are not required to consider the ability of the borrower to pay off the loan, only the ability of the borrower to keep current on the debt by making the minimum required payments, if need be forever. That’s a pretty low bar to clear. But I did stumble on some interesting tidbits in the Fed’s 1155 pages of clarifying details. More on that another day. My wife and I actually tried to get a Target card. We shop at Target quite a bit (diapers, formula, etc add up in a hurry) and the percent-off coupons would pay off quite nicely. Imagine our surprise when we (owners of a stellar credit rating, fairly substantial income, and now debt aside from a manageable mortgage) received a card with a credit limit of $1000. Note that this was a general purpose card – intended to be used to book flights, hotels rooms, etc. So, basically, Target screwed themselves out of a customer that they knew had a minimal risk or default (pay off full balance every month, no excuses) – and ~$20K in annual charges. Wow, they’re probably going to start thinking I’m loaded. If you just looked at how much money flows through my accounts – which would presumably be the best a credit report could do – you’d probably calculate that I make 6 figures. I don’t. I just buy stuff that my employer pays for. Thats fancy talk for “guess”. Thank you a lot for sharing this with all of us you really recognise what you are talking approximately!